(CNN) -- The global economic crisis has caused a spike in world hunger that has left more than a billion undernourished, United Nations agencies said in a new report. The report says the stabilization of financial markets has meant less investment in agriculture, food distribution. "It is unacceptable in the 21st century that almost one in six of the world's population is now going hungry," said Josette Sheeran, executive director of the World Food Programme. "At a time when there are more hungry people in the world than ever before, there is less food aid than we have seen in living memory." The report by the WFP and the Food and Agriculture Organization was released Wednesday, ahead of World Food Day on Friday. Nearly all the world's undernourished live in developing countries, according to the report. An estimated 642 million people are suffering from chronic hunger in Asia and the Pacific. An additional 265 million live in sub-Saharan Africa while 95 million come from Latin America, the Caribbean, the Near East and North Africa. The final 15 million live in developed nations. 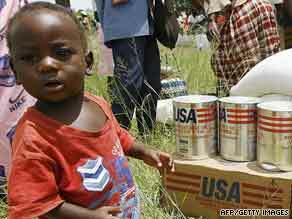 Should developed economies be doing more to eradicate hunger, poverty? The number of hungry spiked as the global economic crisis took hold and governments pumped resources into stabilizing financial markets. The move meant smaller investments in agriculture and food distribution. "World leaders have reacted forcefully to the financial and economic crisis, and succeeded in mobilizing billions of dollars in a short time period. The same strong action is needed now to combat hunger and poverty," said Jacques Diouf, director-general of the FAO. "The rising number of hungry people is intolerable." The report calls for greater investment in agriculture to tackle long and short-term hunger by making farmers productive and more resilient to crises. "We know what is needed to meet urgent hunger needs -- we just need the resources and the international commitment to do the job," Sheeran said.